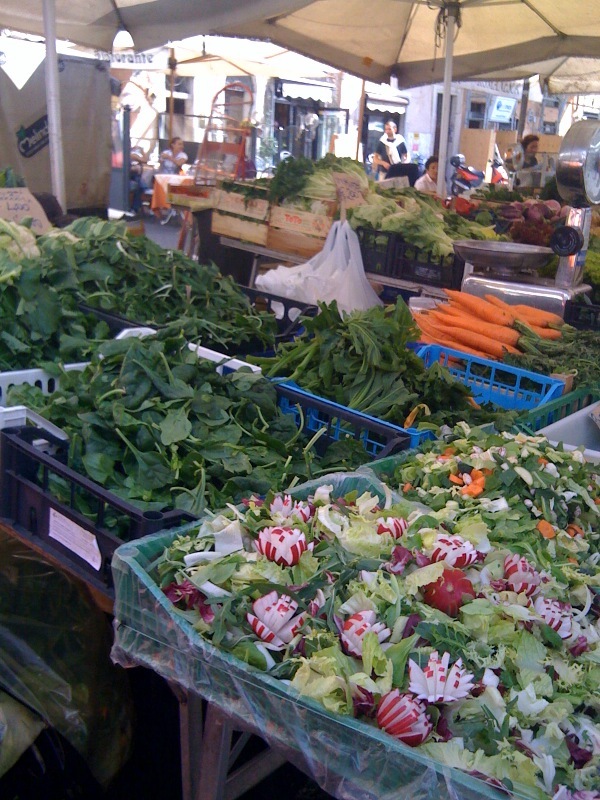 On a crystal-clear, sunny morning, I headed once again to one of my favorite spots in Rome: the Campo dei Fiori. Though it has all the characteristics of a piazza, it doesn’t have that name because it was once the spot where they executed infidels and the like. I recall reading once it couldn’t be called a piazza because executions weren’t allowed in a piazza. Sounds a little bit like a myth. I’ll have to research that one and get back to you. The Campo is now home to all manner of vegetation besides flowers. It is the site 6 days a week (taking a rest on Sunday) to a wonderful farmers market. Filled with familiar and not so familiar veggies. All sorts of curious greens. And industrious vendors. I saw a man today patiently cutting the ends off green beans — about 4 at a time — and tossing them into a bowl of water. Dinner for some busy Roman mama who doesn’t have the time to string her own. I picked up my breakfast at the Forno Campo dei Fiori: pizza bianca, and walked one square over to the Piazza Farnese. You mght recall my story of the sudden rainfall (down a little bit from this post). It was in Farnese. On this day, I sat with my pizza on the benches of the Palazzo Farnese, watching the Italian mamas and their little ones nibbling on THEIR Bianca with a flock of birds flying in a wild formation, and nuns scuttling through the square. In the background I heard someone yelling “Guido. Guido”. Yes, it’s true — open up your eyes, ears and heart a little in Roma, and you too will find yourself in a Fellini-film moment. True magic!